Are you looking for a fun and educational experience for the entire family? Then why not visit the Pennsylvania Lumber Museum located in scenic Potter County on 5660 US Route 6 West, near mile marker 188 between Galeton and Coudersport. Nestled in densely forested Allegheny high plateau country, the museum tells the story of the Commonwealth’s rich lumbering history and promotes the ongoing care, management, and recreational use of its forests. The museum visitor center and exhibits, newly re-opened in May 2015 after a multi-million dollar renovation and expansion project, include thousands of objects ranging from prehistoric stone tools to a variety of twentieth century chain saws. Interactive exhibits allow visitors to simulate activities such as swinging an ax, sawing a tree, piloting a log raft and racing locomotives. 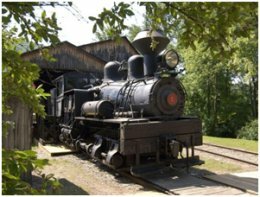 Large outdoor exhibits are located throughout the 160-acre museum property and include a re-created early 20th century logging camp, the museum’s popular 70-ton Shay geared-locomotive, and a 1910 Barnhart log loader. A rustic log cabin build by the Civilian Conservation Corp in 1936 showcases the talents and craftsmanship of these dedicated citizens. Other exhibits include a steam-powered sawmill and log pond, a 1945 Brookville tannery switch engine, and a Sustainable Forestry Trail that loops through forty acres of forest surrounding Commissioner’s Run. The museum’s BARK PEELER’S FESTIVAL, held annually over the July 4th holiday weekend, treats thousands of visitors to lively special events, contests, and demonstrations; all celebrating “woodhick” skills. Unique food and craft vendors provided guests with ample shopping and culinary opportunities. There is live music throughout the weekend, crafts and games at the Kids Korner, an operating steam-powered circular sawmill and birch still, blacksmithing, chainsaw carving, and door prizes. 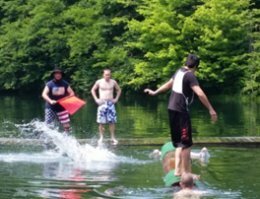 Visitors are encouraged to compete in the greased pole, log rolling, cross cut saw, and birling competitions to earn the title “Grand Champion Woodhick” and the associated cash prize. In addition to the annual Bark Peeler’s Festival, the museum hosts a variety of other special events and programs throughout the year including an Antiques and Collectables Show in April and October. Please call or visit the museum’s web site for more information and a calendar of events. Group tours can be pre-arranged for any day of the week. Between the months of November and March, the logging camp and other exterior exhibits will be available only during favorable weather and temperature conditions.